The Apollo missions really happened and humans have actually visited the Moon. If someone fell victim to the flat-Earth conspiracy, then it would imply that they also fell victim to the Apollo moon landing conspiracy. But they are wrong. 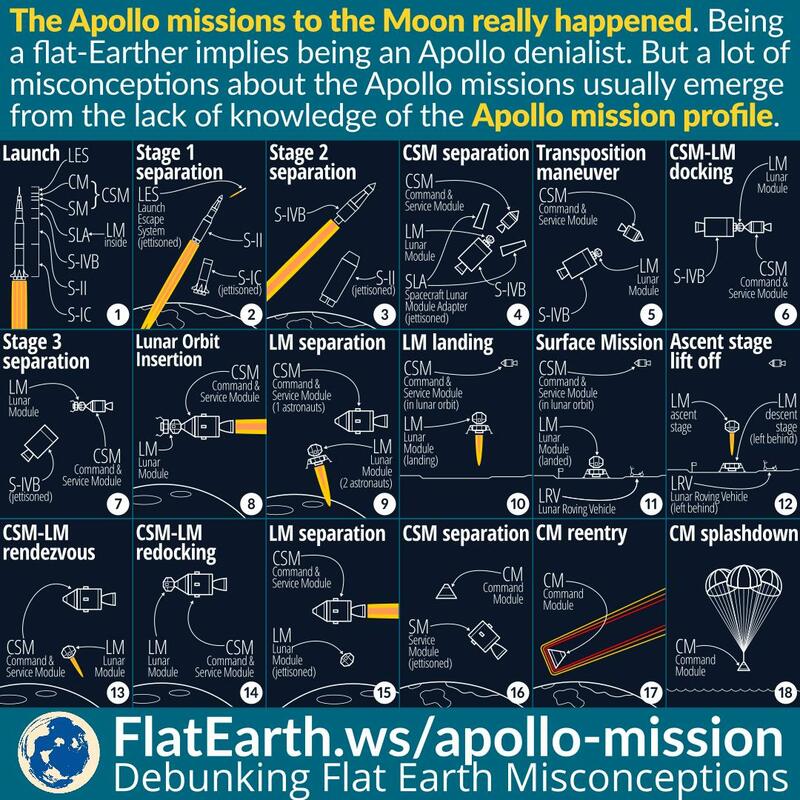 Someone usually fell for the moon landing conspiracy theory because of emotional appeals and confirmation bias, but also because of their ignorance of the Apollo mission profile itself. The following is a very brief description of the Apollo mission profile, numbered according to the numbers in the illustration. The Saturn V lifts off, powered by S-IC rocket engine. It consists of several stages, including three rocket stages. Stage 1 separation. The S-IC engine runs out of propellant and is jettisoned. Stage 2 separation. The S-II engine runs out of propellant and is jettisoned. The S-IVB engine burns twice to perform the trans-lunar injection. CSM separation. The SLA that connects the Apollo CSM to the rest of the rocket is detached, releasing the CSM and exposing the LM inside. CSM performs the transposition maneuver. It turns to face the LM that is still attached to the S-IVB stage. CSM performs docking maneuver with the LM. CSM pulls LM from the S-IVB body. The S-IVB body is then discarded. CSM burns its engine twice to enter the lunar orbit. Two astronauts enter LM and separate the LM from the CSM. The other astronaut stays in CSM. LM lands on the lunar surface. CSM stays in orbit. The two astronauts perform their mission on the surface of the Moon. Astronauts enter LM. The LM ascent stage lifts off. The descent stage and the rest of the payload are left on the lunar surface. LM performs rendezvous with CSM in the orbit. The two astronauts move to CSM, along with the lunar samples. LM is then jettisoned. After reaching Earth orbit, CSM is separated to CM and SM. SM is then jettisoned. CM descends through the Earth’s atmosphere. Parachutes were deployed and splashdown!